Researcher Mariusz Wilk at Tyndall National Institute with the smart glove. Pervasive Nation is CONNECT’s Internet Of Things Testbed and is led by Professor Linda Doyle, Director of CONNECT, in Trinity College Dublin. Pervasive Nation is a resource for industry, government and academia and a catalyst for Internet of Things research and innovation in Ireland. 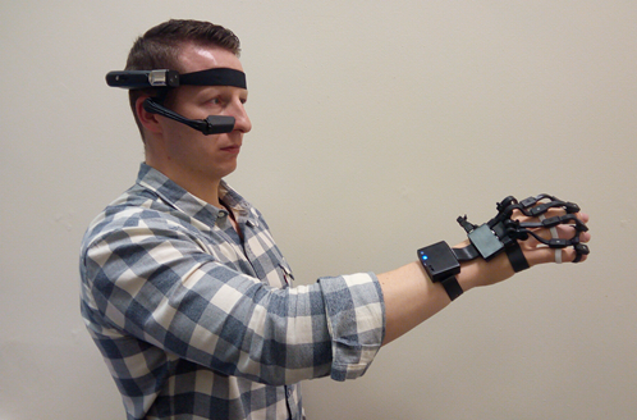 The Tyndall Smart Glove (Haptic Human Computer Interface System for VR/AR and robotics) has been developed by the Wireless Sensor Network group in Tyndall National Institute and led by CONNECT Funded Investigator Dr Brendan O’Flynn.